September’s first event, “Whisky by Flavour” (actually the 43rd in the series), took place in The Gunmakers’ reopened upstairs room in an increasingly Dickensian atmosphere of low light, slanted ceilings, assorted wooden chairs and jovial conversation. Our hosts for the night were Whisky Squad co-founder and Jason B Standing and Edinburgh-based Wemyss Malts. Wemyss Malts (pronounced “Weems” rather than “Weemiss” or “Wemmiss”) is one of a new generation of independent bottlers of Scotch whiskies carving a niche for itself by combining unusual blended malts and distinctive single casks with a strong appreciation of modern branding, presentation and market niches. With company founder William Wemyss unfortunately having to withdraw from the event a couple of days earlier, Wemyss Malts’ PR & marketing manager Karen Stewart made a suitably affable and knowledgeable replacement, her long experience with Glenmorangie and Ardbeg shining through. Wemyss Malts blind tasting revealed! The format of the event was a simple but effective one. 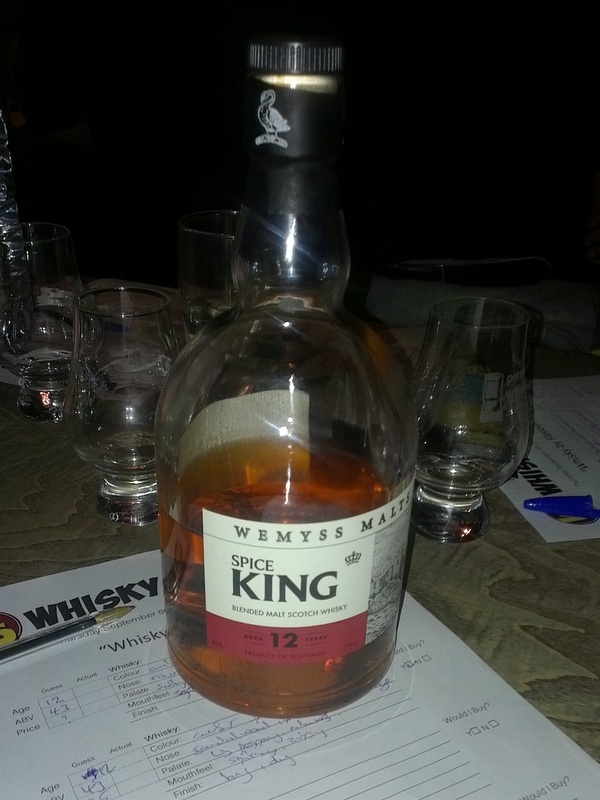 A disguised bottle of Wemyss whisky was passed around the fourteen or so attendees who each poured out a measured sample into a nosing glass, with iced water and pipets available for diluting if desired. We were then encouraged to make notes (assumed price, age, as well as tasting notes) and to offer up (or just blurt out) descriptive words. Comments judged by Jason and Karen to be closest to the official tasting notes were awarded a miniature (5 cl) bottle of one of Wemyss whiskies. The whole process was repeated five times. My whisky tasting faculties aren’t nearly as highly attuned as my beer tasting ones but I wasn’t the only one struggling at times to successfully express the often extremely nuanced flavour sensations of whisky as words, a fact that helped keep the event friendly rather than serious. 5) Strawberry Ganache 1991 (46%) – a single-cask Glen Scotia and the most expensive whisky showcased during the evening. Deep chestnut colour suggests the chocolate orange nose, flavours that continue through to the oily palate where they’re joined by embers and maybe a little tar. Quite rich but I liked it nevertheless. 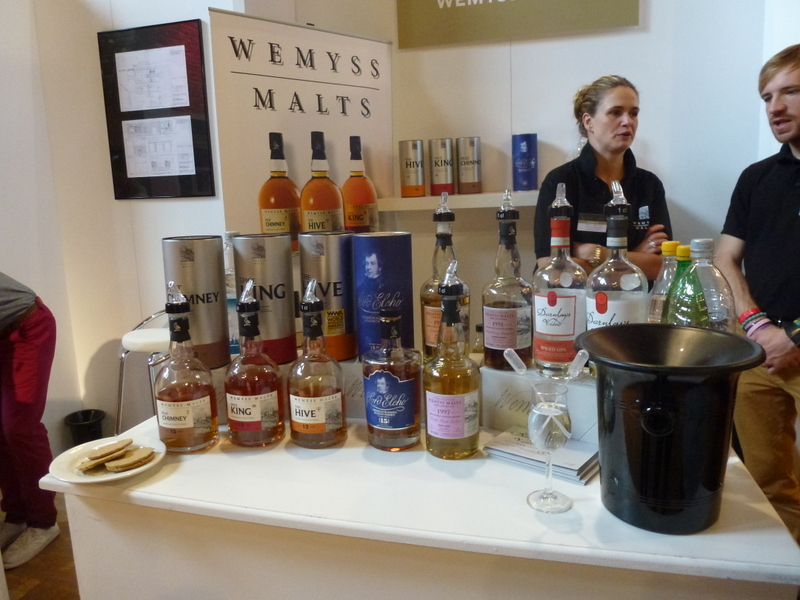 Wemyss is gradually increasing its range with additional single cask releases. In addition, Wemyss’ blended malts are also available as 8-year olds, one of which, Peat Chimney, I was lucky enough to win a 5cl miniature of for having used a couple of descriptive words that struck a chord with our hosts. Taking into account the G&T handed to us on entry (made with the Wemyss stable’s own-branded London-style Darnley’s View Gin), the five whisky samples, the extra slug of our favourite dram after the main tasting (obviously the Clynelish, sorry Fresh Fruit Sorbet) and the lively and friendly atmosphere of the event and Whisky Squad has a winning formula on its hands and is a bargain to boot. It’s just a pity there’s not room for more guests at each event. With seemingly about half of the staff of Borough’s superb The Whisky Exchange in attendance my pal Jon and I were gratified even to have secured places and we were determined to enjoy it. Which wasn’t difficult thanks to Whisky Squad and Wemyss Malts. Here’s looking forward to my Whisky Squad #47, November’s tasting of “extreme” whiskies. can’t wait to find out what’s in among that lot!